The Sprinter is Mercedes’ offering for the large van segment, and has been in production since 1985. The second series was launched in 2006 and a major restyling in 2014 updated the bodywork and the interior. Though modern in styling, the Sprinter is a tried and tested product and able to handle even the toughest missions. 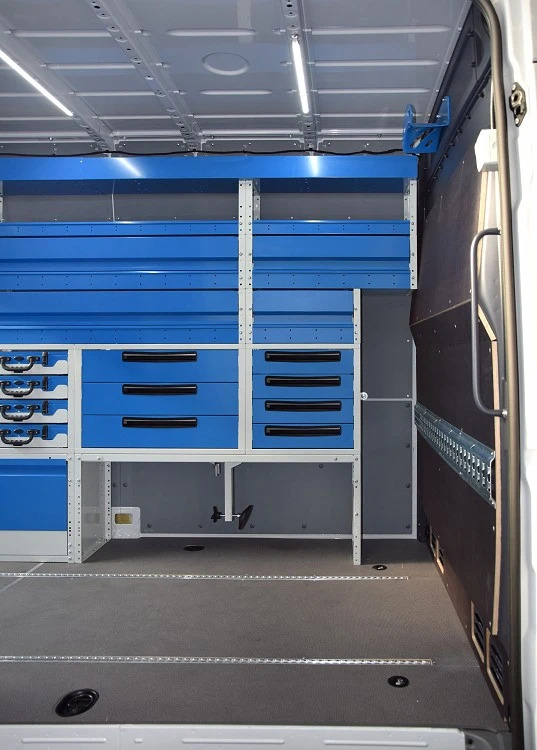 The load compartment is large enough to permit the installation of spacious workshops for a wide range of applications. Syncro System has been committed since 1996 to satisfying the needs of companies and traders whose work takes them away from base to install and service machines and systems. One of the professions that benefits most from a Syncro mobile workshop is that of the industrial refrigeration technician: cooling systems of one kind or another are used by a vast pool of customers in food processing, chemicals, engineering and other industries. Refrigeration systems require proper installation, regular maintenance and rapid intervention in the event of breakdowns, as downtime can have drastic repercussions on production and profit. 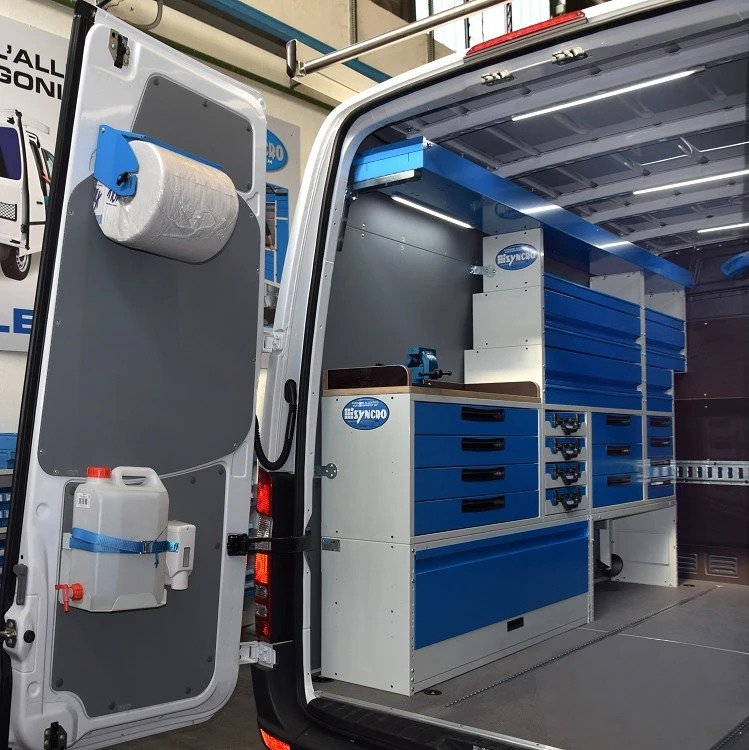 This, of course, is where Syncro System comes into the picture, by providing van users with efficient and effective mobile workshops! 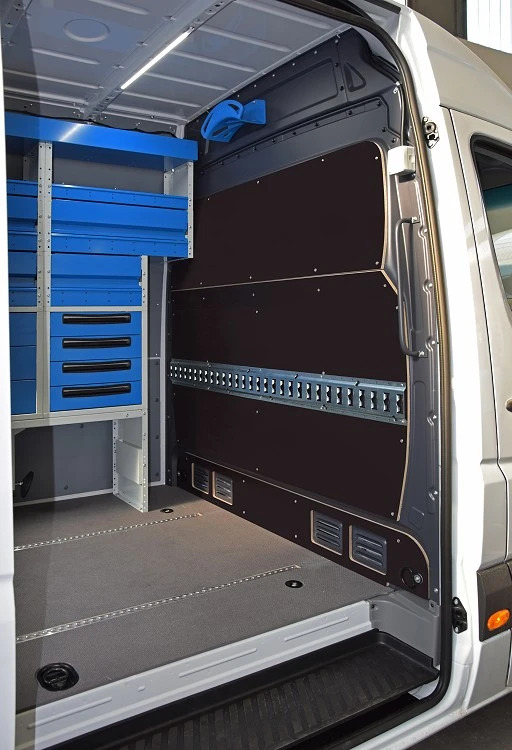 This page illustrates an excellent racking system in a Mercedes Sprinter, complete with interior liners, drawers, shelves, accessories and a roof rack. But let’s start from the beginning! The Syncro installation team always starts by installing a floor liner in either plywood or aluminium. In this particular case they used a standard Sprinter floor liner, but modified it by adding milled and drilled aluminium rails for securing cargo straps. 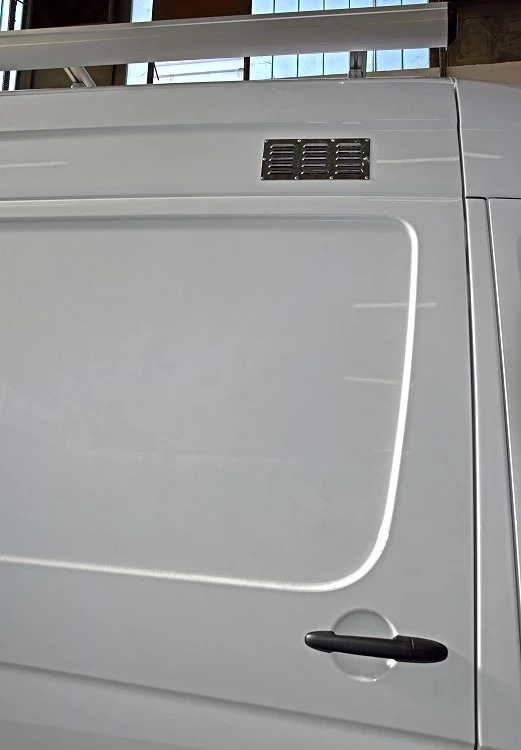 As with all vans, the Sprinter’s body is almost totally unprotected against impacts from cargo and is therefore susceptible to damage during normal use. To solve this problem, the Syncro team installed a plywood bulkhead liner. They then covered the van’s side walls and doors with laser-cut panels in honeycomb plastic. Moving on the racking itself, on the left of the van we can see two wheel arch cabinets, one closed with a door and the other open, with a tool case shuttle. Over these are four drawer cabinets. Three house large drawers on telescopic ball-bearing runners, and come complete with non-slip mats, space dividers and an automatic system for holding them shut. The fourth contains case trays instead of drawers, each with a steel component case. Above these we come to a work bench with a plywood top, side fences and a steel vice. To the right of the workbench are four shelves with dividers and fold-down doors. Another two open shelves are fitted higher up. The element at the top of the racking is a full-length tray with rear access door. This long, narrow tray is ideal for carrying difficult items like pipes, rods and cable channels. 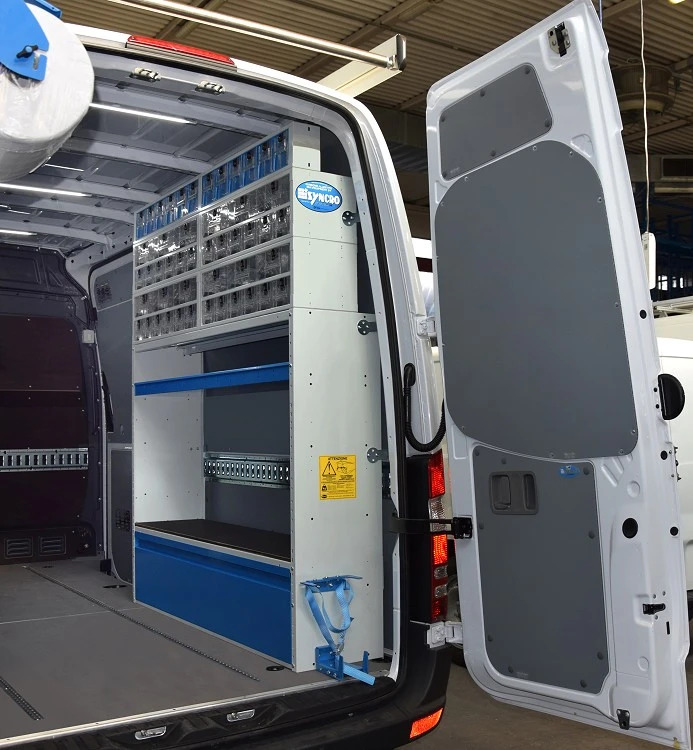 The bottom racking module on the right of the Sprinter consists of a wheel arch cabinet with door, a compartment for carrying gas cylinders etc., complete with a plywood floor, and a shelf. The top section consists of a series of cabinets containing tough and long-lasting transparent containers in PMMA, one of Syncro System’s best-selling products. These are ideal for carrying large amounts of small to medium size parts in an orderly fashion, with contents clearly visible and easily accessible. The containers can be removed easily for carrying around on site and refilling from stores, and feature a special button for locking them shut. The Syncro catalogue contains a vast range of accessories designed to make your work easier and more productive. 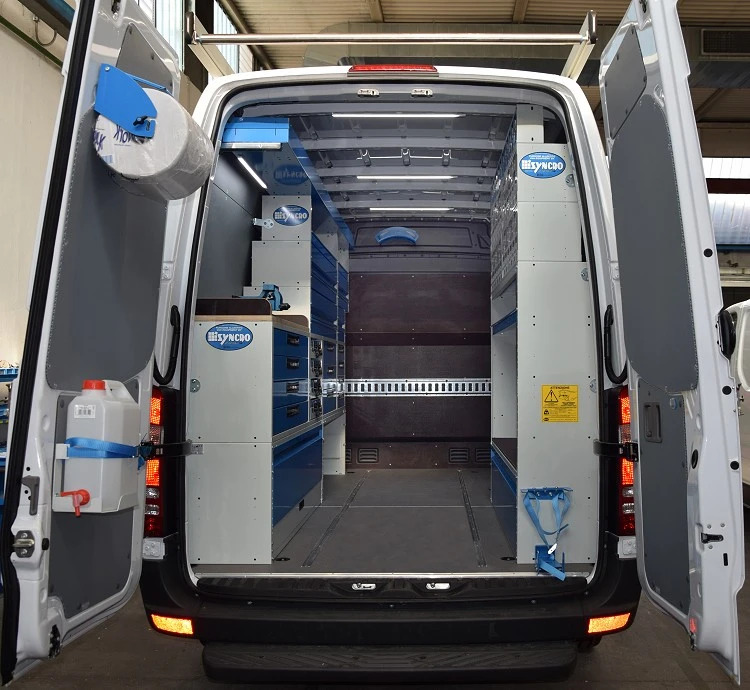 The user of this particular mobile workshop for servicing refrigeration systems has chosen a number of useful accessories from the Syncro catalogue to complement the van’s racking. Inside the left side door is a handwash kit with water canister and tap, a liquid soap dispenser and a holder for 270 mm paper rolls. The rear of the right side racking is fitted with a universal fire extinguisher bracket, and the bulkhead features a cable and probe holder. Refrigeration engineers often need to carry cylinders of refrigerant gas around with them. To stop these from sliding around, the van has been fitted with two rails for cargo straps, one along the right side wall and the other at the bulkhead. As already mentioned, two more aluminium rails have been recessed into the floor liner for the same purpose. The load compartment is brightly lit by four powerful, low consumption LED ceiling lights. Ventilation of the work area has been improved by fitting grilles in the side door. Last but not least, to allow full use to be made of the space on the roof of the van, a roof rack with loading roller and side fences, made from steel and aluminium, has been fitted. 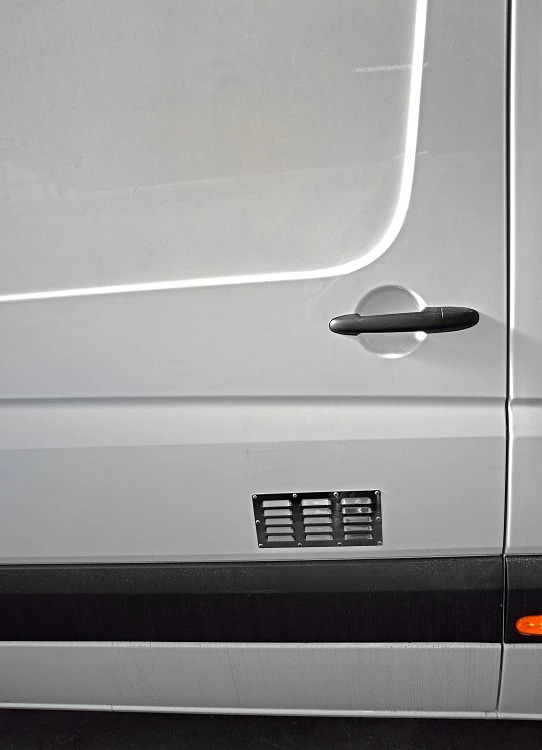 This features Syncro’s exclusive ULTRASILENT 4 profiles to keep noise and vibration to a minimum when the van is travelling. Syncro has been helping customers to work better for over 20 years and in this time has fitted out nearly 70,000 vans. Now the company that chose this racking system for their Sprinter will be able to serve their customers more efficiently too!